BA was formed in July 1975 as the BOSTON ASTRONOMICAL ASSOCIATION by a keen group of people interested in all aspects of Astronomy located in and around Boston, Lincolnshire, England. In 1981 the name became BOSTON ASTRONOMERS and over the years the Society has held public speaker meetings, observing sessions (including showing the public Halleys Comet, Comet Hale Bopp & other sky events), coach trips to places of Astronomical interest and Three National Conventions - EYES ON THE UNIVERSE I , II & III - the first & third of which celebrated our 10th & 20th Anniversary respectively. The Society is open to anyone who has an interest in Astronomy, SpaceFlight & Space in general. No prior knowledge of Astronomy etc is required for joining our Society - just enthusiasm for the subject. BOSTON ASTRONOMERS used to meet on the 2nd Monday of the Month from September to June at Blackfriars Arts Centre, Spain Lane, Boston, Lincs. The meetings start promptly at 7.30pm in the Middle Studio (it is advised to arrive early in order to find a parking space & also to ensure a seat!). The general format of the evening usually includes a round up of upcoming events on Radio & TV as well as local society news, followed by a Guest Speaker, talking on their particular subject of interest. Subjects covered over the last few years includes such diverse topics as 'Black Holes', 'The Planet Pluto', 'Sir Isaac Newton', 'Eclipses' & the 'Galileo Mission to Jupiter' to mention just a few. The meetings also may include a brief look at what's in the night sky for the current month and refreshments are also provided during the evening. Away from the regular Monthly meetings we also hold (weather permitting!) Star & Planet watches at various venues near Boston where members and guests can observe the night sky with both the Societies Telescopes or Members own Telescopes (of which there are several).The Society also operates a Telephone Sky Alert Network in which Members can alert each other in case one of them sees an Aurora or other sudden phenomena and can pass on the word without having to 'phone everyone individually and subsequently missing the sight themselves! This has proved especially useful in allowing many of our members to see the Russian Space Station MIR for the first time during March 1995, displays of the Aurora Borealis (known as the Northern Lights) as well as the more recent Iridium Satellite flares that can sometimes rival the brightest of the planets for a matter of seconds. This Network is only available to members and is a benefit of Membership. Boston Astronomers also organise occassional coach trips to such places as Jodrell Bank, The Cambridge Observatories & Greenwich Old Royal Observatory. Our activities also include putting on displays at various venues & shows such as at the local Library and recently at a local Departmental store in Boston to promote the bright Comets Hyakutake & Hale Bopp. The Society has close links around the county with all the main Astronomical Societies which includes Cleethorpes, Lincoln & South Lincs Astronomical & Geophysical Society and every so often we all get together for a special meeting usually held at the Horncastle College. 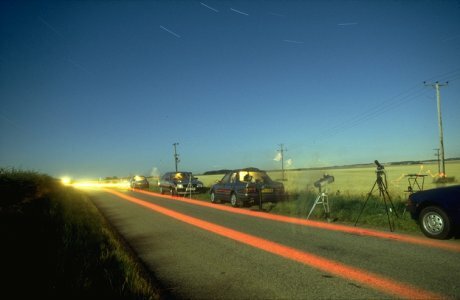 The four groups also occasionally get together to observe special sky events such as Lunar Eclipses & occultations as shown in the accompanying image. Contacts are also strong with the main National Societies including the Royal Astronomical Society, British Astronomical Association, the Federation of Astronomical Societies & the British Interplanetary Society. Some members are also delving into the world of Computer BBS's & the InterNet including former Chairman Paul Money on whose Web space these pages reside. All in all Boston Astronomers try to bring the Universe within everyones reach and we hope that if you are local to Boston & the surrounding area then maybe you are interested enough to join the Society to help us inform, educate & enlighten anyone interested in the Universe around us. For more information regarding Boston Astronomers contact the society by writing to the Chairman Keith Griggs at the following address: 179 Woad Farm Road, Boston, Lincolnshire, England, PE21 0EF (Tel. (01205) 336102 or you can email him or visit his Boston Astronomers forthcoming speakers Web page. Note that you should not e-mail or telephone Keith if you wish to book Paul Money for a talk, use this link to go to Paul's Talks page or e-mail Paul L Money directly. The group meet on the 2nd Monday of the Month from September to June at Blackfriars Arts Centre, Spain Lane, Boston, Lincolnshire at 7:30 pm.